Forex day trading is trading in and out of a position, or positions within a single business day, a market session, or any period within those timeframes. Traders use this approach for a variety of reasons. For example, it may suit them to trade early in the morning before they head off to a full-time job or to trade for just a few hours after they finish their day job. For other traders, it’s both a discipline and a lifestyle choice. It lets them relax out of hours without having to worry about overnight exposure, or positions and prices moving against them when they are asleep or unable to monitor the markets. When you consider that Global Foreign Exchange markets operate continuously from late on Sunday evenings, London time, all the way through to the close in New York on Friday evenings, then this approach starts to make perfect sense. Against this background then, you won’t be surprised to learn that Forex day trading experienced rapid growth in popularity among retail and professional traders. Direct Market Access (DMA) became available to all – Via the internet and dedicated trading software. Such as Pepperstones MT4 and Ctrader platforms. More recently, fully functioning mobile trading platforms have created a second wave of day traders who are now able to trade and monitor the markets from just about anywhere they can get a stable high-speed Wifi or 4G connection. For full details of our trading platforms including options for both iOS and Android devices, click Trading Platforms. Please note that there are demo and live account versions available, across all of our trading platforms. As we noted earlier, Forex day trading describes any Forex trading activity that is concluded within a single business day. Traders may open and close just one or multiple positions within that time frame. In fact, the most active (dedicated) of scalpers could trade hundreds of round turns in a single business day or session. Scalpers are vigorous short-term traders who aim to make a small margin on a high volume of trades. But they want to finish the day flat, that is without any open positions, and therefore Forex day trading meets their requirements perfectly. It’s not just scalpers who deploy day trading strategies in the Forex markets. Longer term swing traders, who, unlike the directionally agnostic scalpers, look for emerging up or downtrends, and are sensitive to overnight exposure too. And though their positions may be open for several hours, rather than just a few seconds, they will also often close out positions at the end of the day. To be perfectly accurate having no open positions overnight is not an entirely risk-free stance. That’s because you incur the opportunity cost, of not being in the market, i.e. you have the risk of missing out. But Forex day traders are prepared to accept that compromise, if for no other reason than it’s frankly impossible to quantify that opportunity cost, ahead of the event. The classic day trading strategy involves the use of indicators, such as a pair of moving averages. Traders will typically plot a faster and a slower moving average together, perhaps lines drawn over say 5 and 20 periods. By definition, the 5-period line will be four times as sensitive as the 20-period version. This is because it’s re-calculated four times for every time the 20-period line is updated. Having selected their moving averages, traders will then use the interaction between the two lines as a trading signal or indicator. The more sensitive or faster moving short-term line provides directional clues and definitive signals when it moves above or below its slower moving counterpart. We can see a clear example of this in the 30-minute chart of AUD USD below. A 5-period Simple Moving Average (SMA) is plotted in orange, while the slower moving 20-period line is drawn in red. Note how the 5-period line helps to define the uptrend in the early part of the chart, before moving downward, as the underlying rate corrects. As the price rallies once more, the 5-period line starts to pick up before crossing definitively above its slower moving counterpart, in a run-up to a re-test of the prior high. In the third ellipse, we can see the orange 5-period line moves lower and crosses below the 20-period line once more, it tests back to the line but then falls back, pre-empting the sell-off, denoted by the adjacent large, white candle. The example above shows the type of interaction that Forex day traders are looking for. However, to use this type of strategy, there is a certain amount of interpretation that’s required on the trader’s part. 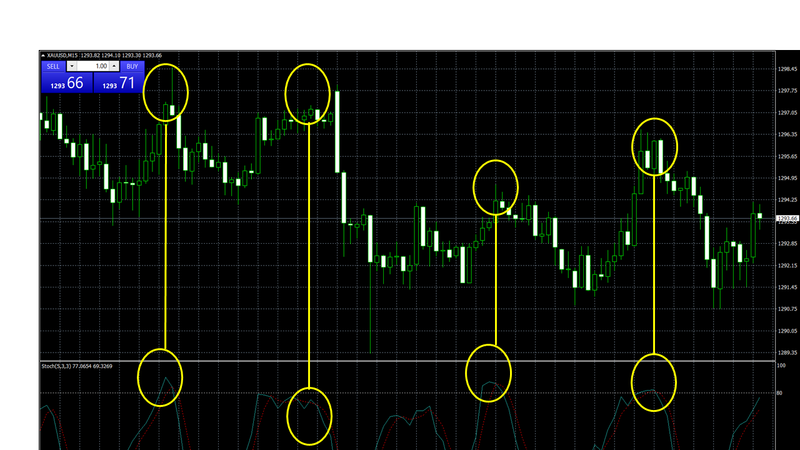 A more sophisticated Forex day trading strategy might involve the use of stochastics. 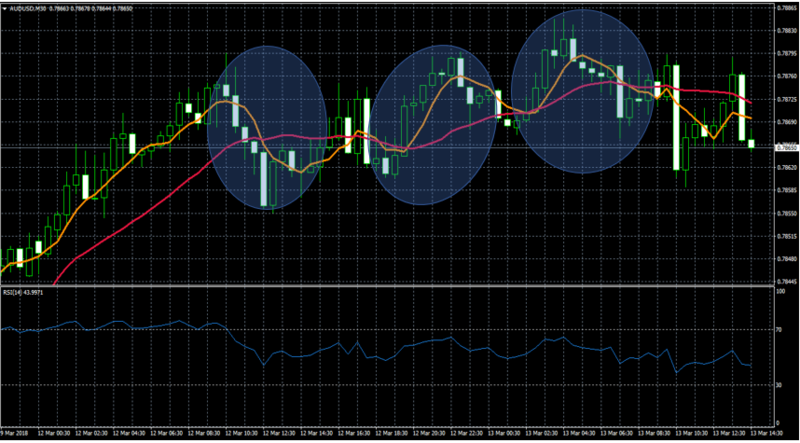 Within Forex trading, the term has become associated with a method of tracking and ideally predicting price momentum. In this instance, momentum relates to the amount of impetus or “oomph” that a trending price contains. If we can identify the points at which a trend runs out of steam, then we can potentially benefit from not only the existing trend but from any countertrend price action as well. As with our earlier strategy example, the stochastic indicator plots two interactive lines as and an additional moving average known as %D line. The moving average tracks the changes or deviations in what is called the % K line. Which is simply a record of the current price performance, that has been rebased and compared to the price performance seen, over 14 prior periods (though that figure can be adjusted as required) In essence, we end up with an indicator that compares the current price momentum to that seen over the longer term. That comparative performance is then expressed as a value between 0 and 100. Readings above 80 and below 20 are effectively overbought and oversold indicators, respectively. The chart above is a 15-minute plot of Gold in USD (XAUUSD) in which we highlight several signals from the stochastic indicator in the lower window. The first signal highlights an overextension in the indicator above 80%. As the gold price sells off, it coincides with a reversal candle or shooting star. Our second and third signals are examples of the %D line in grey and the %K line in red crossing and heading lower. In both cases after the signal, Gold subsequently sells off and down to horizontal support. In our final example, both the %D and %K lines test at the overbought boundary of 80 and reject the move above it. Once again, the gold price sells off thereafter. These are just two out of many Forex Day Trading strategies that you can employ. Whichever you choose to adopt, there are some simple but effective guidelines to consider. Choose a strategy that’s right for you. That means picking or designing one that you find intuitive to use and easy to read. After all, if you can’t interpret what a strategy is or what its indicators are telling you, then it’s useless. Make sure that it generates regular signals regarding both the time frames and instruments you trade. That said, you don’t want the signals to come so thick and fast that you can’t react to one before the next one turns up. Don’t feel that you need to slavishly stick to just one Forex day trading strategy because they can and should be used in combination. Deploying complementary indicators such as RSI 14 and Moving Averages, for example, would allow you to create a hierarchy of signals. The strongest signals being those that are confirmed by both indicators, simultaneously. For example, the 5-period MA line crossing down through the 20-period line, at the same time as RSI 14 rejects at a reading of 80 or above. When testing a new Forex day trading strategy, do so on a demo account initially, and once you are happy with its performance, then you can scale its use within the live trading environment. Good luck in your day trading endeavours.